since 1987. 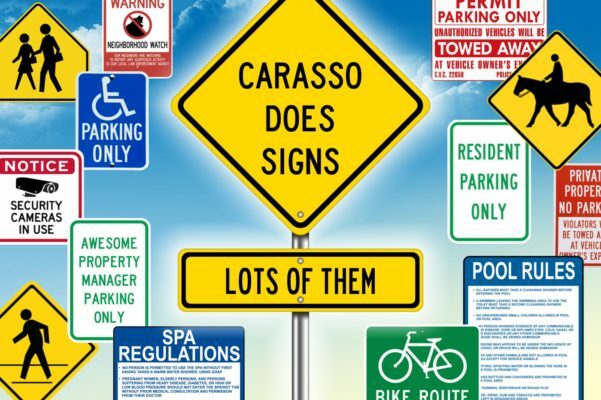 We take care of providing and expertly mounting your shiny new street signs, pool signs, fire lane signs and more. From 1 to 100+ signs – no job is too big or too small. We work with property managers to keep residential communities safe and looking smart. Our skilled teams will replace address plaques and posts as well as refurbish your development’s entrance sign monuments – making sure the job is done quickly at a competitive price. Contact us today with your standard or custom signage needs. We’ll sign you up! "The quality of the work has always been superb & the crew extraordinaire. I always relied on Carasso to complete key, sensitive jobs. You've NEVER failed us. I personally enjoy working with you and your staff."